I actually didn’t have a thing for vanilla custard slice until after becoming vegan. I tried one at my favourite vegan bakery and just fell in love with it! What I didn’t like was the sugar overload headache it came with, so I went out to create my own, making it healthier than the average dessert. I like to add some oil to the inside edges of the pan to stick the baking paper down. This makes it easier to press down the base mixture into the pan, and for when pouring the custard in. It also creates a straighter edge along the custard when set. When cooking the custard, you want a thick custard consistency. If it’s not thick it won’t set firm enough to cut. It will feel fragile when taking it out of the pan but don’t worry! Be a little gentle and all will be fine, it has more hold than you think. 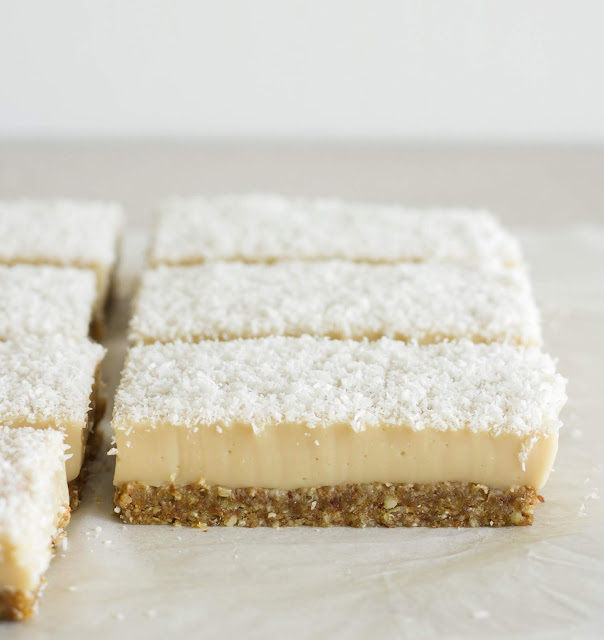 No Bake Vanilla Custard Slice made vegan, gluten-free, soy-free, oil-free, only 8 ingredients and made healthier than the traditional custard slice. Add almonds to a high speed blender or food processor and pulse a couple of times to break them up a little. Add the buckwheat, and pulse again to break them down and combine with the almond. Add dates and blend until the mixture sticks together, scraping down the sides when needed. Press mixture evenly into the pan, and set aside while making the vanilla custard. Off the heat, pour almond milk into a large pot. Add the cornflour and whisk well to combine and remove any lumps. Whisk in the rest of the ingredients. Make sure to stir regularly, I like to use a heat resistant silicone spatula for this. The custard will start to form first on the bottom, when you notice this happening, give it a whisk to make sure the custard stays smooth (continue to whisk now and then). When it starts to thicken, turn down the heat to low. Still stirring regularly, keep cooking until it’s a thick custard consistency. Pour onto the base, and tap the bottom of the pan on a bench to remove any bubbles inside of the custard. Top with the coconut. Refrigerate for at least 3 hours or until set. Cut into 16 squares. Store in an airtight container in the fridge. 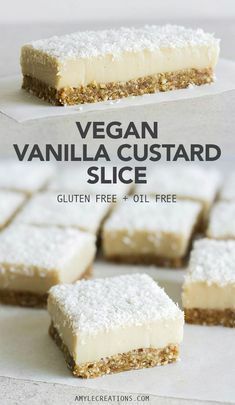 0 Response to "NO BAKE VEGAN VANILLA CUSTARD SLICE"